Today, I saw a status update on Facebook where a person described their house as quiet, since their children were now off at college. He advised parents to cherish the years their kids are at home because time flies by too fast. I've heard this countless times before, but this time it resonated more. I know my children are still very young, but having two at school all day this school year is really different for me. The house is not as active. I am not needed as much to help with this and that. The monitoring of sibling arguments has all but disappeared during the school day. The pace of life is much, much slower too. I miss my two older children at home during the week. I feel like I am getting a tiny taste of what life is going to be like after "time flies by too fast." My hope is that the memories my wife and I have created with our children, including the bedtime stories, long walks in the neighborhood, family dinners, day trips, and all the books that fill our shelves, have etched a desire for them to come home after they are off to college and beyond. I know we'll need that. David Small described Sarah Stewart's six picture books as "a kind of 'no place like home stories' that are gentle, human, and real." (Publisher's Weekly). Her books include The Money Tree (1991), The Library (1995), The Gardener (1997), The Journey (2001), The Friend (2004), and The Quiet Place (2012). Sarah Stewart's stories come to her very quickly, like a "burst," but she takes great care in the revision process to get the story "shorter and crisper and therefore larger, larger in its impact, so that every word is a world." (Reading Rockets). Sarah Stewart's latest book, The Quiet Place, is about a little girl named Isabel who moves with her family from Mexico to the United States. Isabel writes a series of letters to her Auntie Lupita describing her experiences adjusting to her new home. 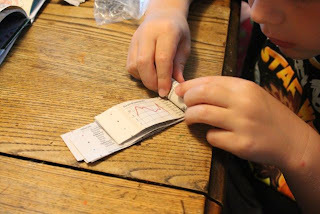 In many of the letters she tells her Auntie about the "quiet place" that she is building out of cardboard boxes with her Papa and her brother, Chavo. Her Auntie learned that Isabel's "quiet place" makes her feel safe. 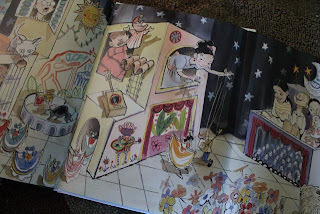 There are clues throughout the book about the quiet place, "there are many rooms" and "Today Chavo said, 'The colors in your house make me want to dance." The illustrations give us tiny glimpses too. One illustration shows the supplies that Isabel is using to decorate the "quiet place" and another reveals some of her artwork and origami. All these tiny hints and glimmers lead up to a fantastic finish; the final 4-panel illustration. It is stunning, kids playing, having fun, smiling, and laughing, so much to look at. 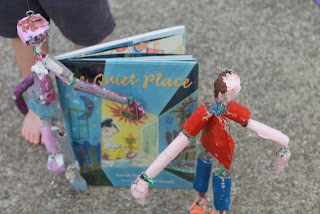 When I read The Quiet Place to my children and reached that final illustration, my five-year-old son focused in on the marionette that Isabel is playing with and asked, "Are those puppets from the 'olden days'?" My son's question to me was what Sarah Stewart has described as a "kernel." Sarah Stewart and David Small have a friend named Abby Aceves who moved from Mexico to Gary, IN. 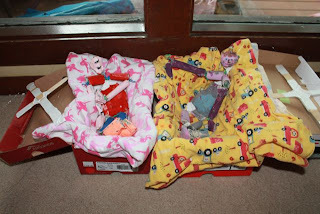 She told Stewart about how hard the move was and about the cardboard boxes that she played in with her brother. "That was the kernel. That was the beginning, the origin of what became my story, "The Quiet Place" about Abby. All of my stories have started the same way. It's always about a friend that says something to me." (mLive). I wanted to answer my son's question about marionettes by making one. I searched and searched and finally found instructions that I could modify to make homemade marionettes out of items we had around the house: newspaper strips, paper clips, tape, twistee ties, tongue depressors, and clear fishing line. 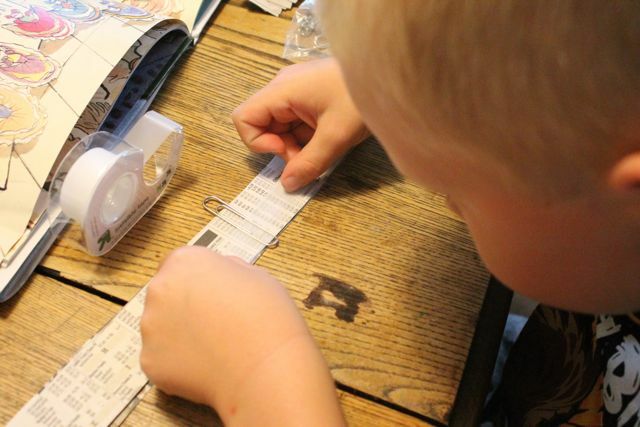 Once the paper clip was taped my oldest son rolled the newspaper strips. 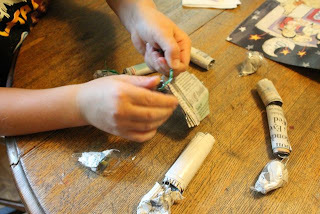 While he held the rolled tube of newspaper I wrapped tape around it so it wouldn't unravel. 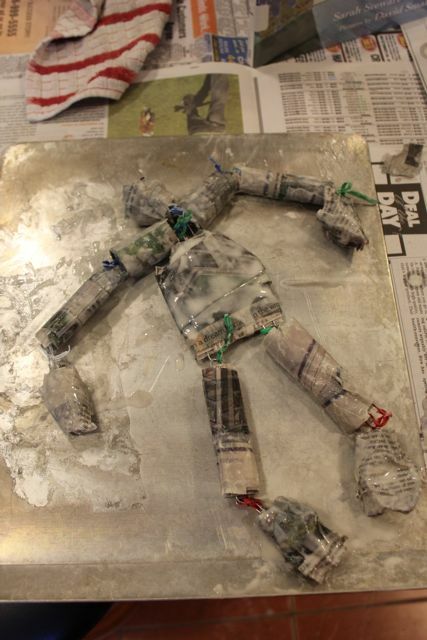 We made each part of the body a little different. We made longer limbs that needed two paper clips. The head was shaped like a ball instead of a tube and the body was big and rectangle-shaped. We made sure that the loops from the paper clips stuck out from where we wanted to attach another body part. 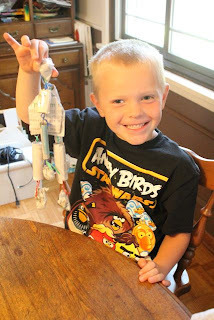 My son used twistee ties from bread bags to attach the paper clip loop from one body part to the paper clip loop on the other body part. He was so proud to that he put together his marionette all by himself! It was at this point that he started to understand what a marionette really was. 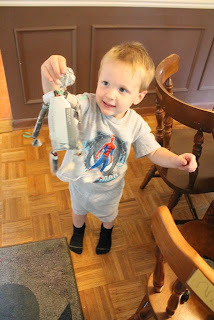 My youngest son made a marionette too. 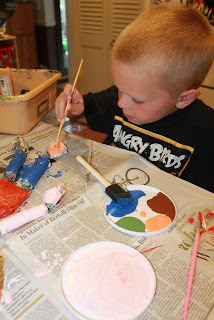 I wanted to have the boys paint their marionettes, but I didn't think it would work well with the tape on the outside of the strips, so I made a small batch of papier mache. 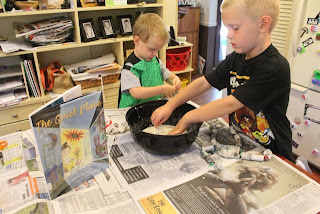 I mixed 2 parts water to 1 part flour with a pinch of salt. We covered each part of the marionette with one layer of newspaper strips that were dipped in the papier mache mixture. Then, we set it out to dry in the sun. Once the marionette was dry he painted on blue jeans, a t-shirt, and cool sneakers. 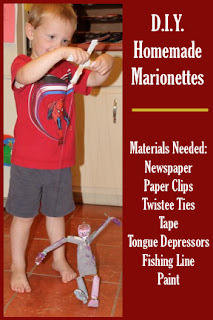 The next day I made a marionette controller out of tongue depressors and used clear fishing line to string the marionettes. I used a total of three strings. The first one went from the loop on the top of the head to the center of the controller. The other two strings went through the loops at the joint of the hands to the ends of the controller. I used duct tape to secure the strings to the controller. The hardest part about stringing the marionettes was getting the length of the strings just right. My thought from the beginning of this project was that we would make a "quiet place" theatre for our marionettes. 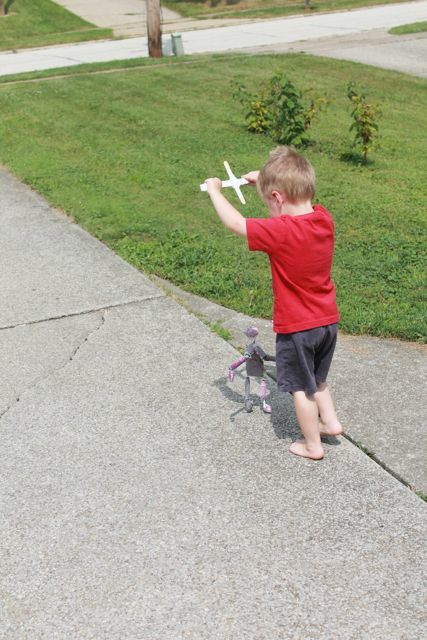 However, I never in my wildest dreams thought I would be playing with the marionettes outside. I decided that making the theatre wasn't necessary. 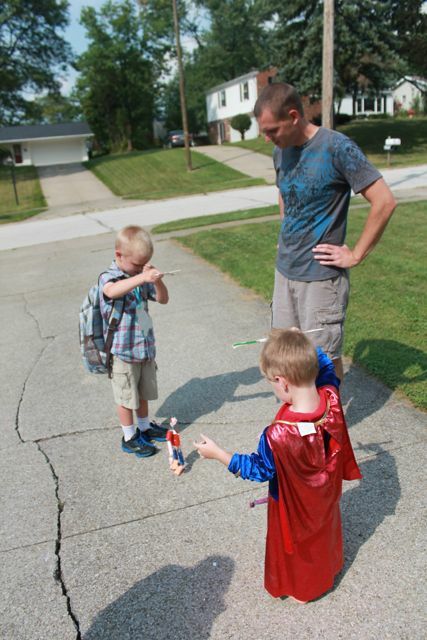 My oldest son returned home on the school bus after his first day of Kindergarten. The marionettes greeted him. 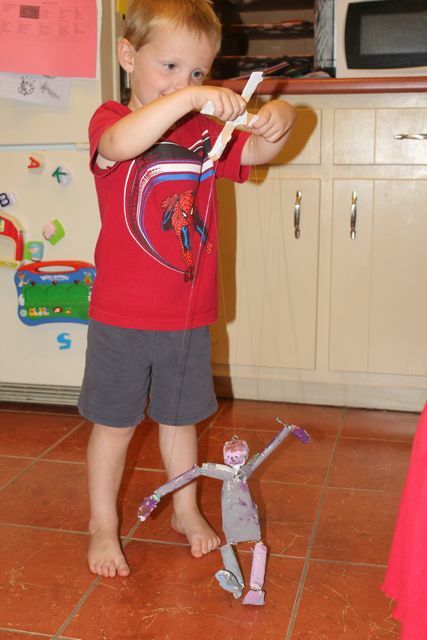 He had a great first day of school and was happy to see the strings on his marionette when he got home. 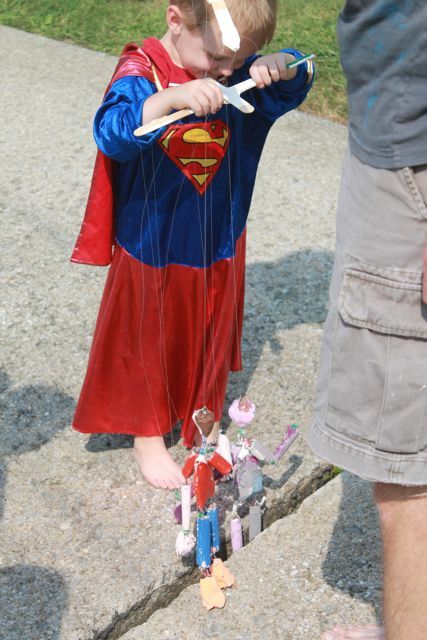 My youngest son, while wearing a Supergirl outfit, showed his brother how the marionettes worked. 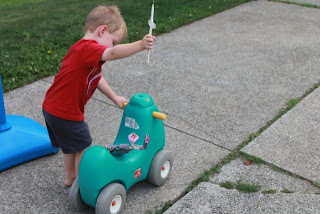 He led the marionettes to a crack in the neighbor's driveway that was the perfect size to get stuck! The marionettes, who by this time earned the names "Old Man" and "Silly Man," helped each other get unstuck from the crack. when they were busy once again! They even made a trip to Grandma and Grandpa's house for the weekend! My son's "kernel" of a question burst into an experience I never imagined. It wouldn't have been possible without the wonderful book from Sarah Stewart and David Small! It is experiences like these that I know I will miss someday! Sarah, my family hopes that you have a happy birthday and thank you for writing stories that my children and I really enjoyed reading together. If you are on Pinterest, please pin this picture. Follow Happy Birthday Author too!